This can be true for so many different things. However, the first 2 that come to my mind at this moment is a relationship and a career. 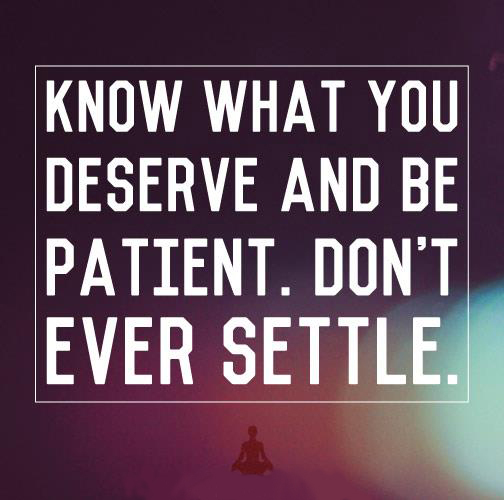 There are so many times where I have to remind myself not to settle on either just because it’s convenient or because I’m scared that what I want won’t come along. Fear can prevent us from acquiring greatness. Whether it be the fear of being alone or the fear of trying something new. So, I’m trying to prevent myself from making a decision out of fear in either one of these categories that I will regret later and feel as if I settled. There are too many people and opportunities out there for us to compromise our ultimate happiness. I came across this yesterday and it gave me such an uplifting feeling, so I wanted to pay it forward by sharing it with you all. This is a picture of a free school for slum children under a metro bridge in New Delhi, India. Rajesh Kumar Sharma, uses black boards painted on a building wall to teach at least 30 children from nearby poor villages free of cost for the last three years. Sharma dedicates 2 hours out of every week day for this cause. He was forced to drop out of college due to financial difficulties, so he decided to start the free school in hopes of sparing these children the same difficulties he faced. After convincing their parents to allow them a 2 hour break from their work, he manages to keep them ahead of the school curriculum. Dang all of the sudden I’m getting love left and right. It’s truly an honor because I believe you are all 100 times the blogger I am. Your words seem to come so easily and eloquently. Thank you for all the likes, comments and support. For this award I will nominate some blogs and/or the people that the blogs belong to that have touched me or inspired me in some way. I know some of you have already been nominated for this award or your not even accepting awards, but you’re getting it anyways, ha. Thank you! 2) Post the award image on your page. 3) Tell seven (7) random facts about yourself. 6. One of the most difficult parts about being in a chair is when a child too young to understand wants me to get up and play or get on the ground with them. 7. I want to know where all the lost socks go. 4) Nominate fifteen (15) other blogs. Since finding this great avenue of connection that we have here on WordPress I have read some phenomenal pieces by you all. Some come here and share their most recent dating stories. Some come here to share their beautiful and powerful poetry. Some speak of painful memories that they’ve held on to for years. Some take me to other parts of the world by sharing their travels. Regardless of what is you all share it given me the desire to air a bit of my emotional laundry as well. You bloggonians have shown me enough care and love that I feel like you are shoulders to cry on and/or hands to high five in my highs. With this said I feel like I can vent here and share with you all, and it’s a great feeling. I was quite apprehensive to write and share this because I feel like I’m whining or something. Plus, you are all such great writers here and your words seem to flow so effortlessly that I feel like a mere novice. But who knows, maybe some of you will be able to relate to this or use it as a heart break prevention tool in the future. She was quite aggressive and actually asked me when I was going to ask her for her number. I was instantly attracted. It’s cute and aggressive. Once numbers were exchanged the communication pattern began. Multiple texts a day including good morning have a good day 🙂 and good nights seasoned with sweet dreams. Then on to that first beautiful and exciting actual phone call. Now we are firing on all cylinders laughing, sharing and making plans. Let’s now fast forward to the crime scene. The texts become few and far between. There are no random phone calls and she always seems to be BUSY. So I push on despite my healthy dose of skepticism. I lean on my trust in her. Now it’s getting a bit ridiculous and I ask the what the problem is. She replies sorry I’ve just been BUSY with work, family and enlisting duties for the navy. What can I do, call her a liar and demand she still makes time for me? No way, then I become the problem. So once again I reach into my trust stash and believe her. Now weeks passes by and no word. I send a text that stirs a response and learn that too BUSY actually means seeing someone else. I would share the confession text with you, but I deleted it. She was great right off the bat. She made the first move and wrote me first. Once again I love the confidence and assertiveness. Our numbers get exchanged more quickly this time and I wait till Valentine’s day to deliver the first text. She is elated upon receiving it. We text back and forth regularly for weeks before we actually talk. The random hope your having a good day texts are running freely. The disclosing of our past, our hopes and our interests are a daily affair. We are getting closer and more comfortable with each other. Normal communication begins to change. The questions and interest begins to fade. The random texts are a thing of the past. The last text in our phone conversation shows me posing a question, but getting no reply. If I don’t try to call I don’t think we’d even talk. I ask her what’s up and she tell me she been busy with work, moving and buying a car. I tell myself surely it isn’t happening again. I mean I just told this girl about how this had just recently happened to me. No way somebody could repeat the same offense that you shared with them. Once again I reach into my trust bag and remember reassuring things she had told me. The trust begins to wear thin and today I asked her if I’m liking and thinking about someone who isn’t doing the same. And here’s the reply I got: Good morning babes! 🙂 I do want to apologize for being a little distant recently. I have ALOT going on around here and in this damn brain of mine. I want to be honest with you because that's what you deserve. I met someone about a month ago through mutual friends and we have hung out a lot recently. Im not sure what is going to come out of this but I don't want to be dishonest with you because that's not who I am. I think about you a lot through out my day and I am a bit confused to be honest. What I’ve learned from this is that if things seem like they don’t add up, they probably don’t. Trust your instincts. In both instances I chose to believe what I wanted to be true versus what actually was. 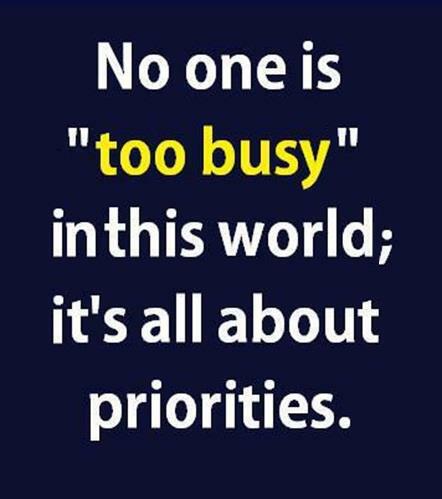 Like the quote says above no one is really too BUSY. There are 24 hours in a day. We can spare seconds or minutes to let the people we care about know that we still care. So the moral of the story boys and girls is Beware of Busy Bees, they still can sting. Thank you Megan메간 for the Versatile Blogger Award (VBA) nomination! A description I found said this about the VBA. It’s a mutual admiration society where bloggers recognize their peers for writing quality blogs that touched them in some way. The VBAs honor the blogger rather than specific posts. It’s a chance for bloggers to pat themselves on the back like the American Academy of Motion Picture Arts and Sciences does with the Oscars. Until someone starts giving out Blogscars, the VBAs will have to suffice. 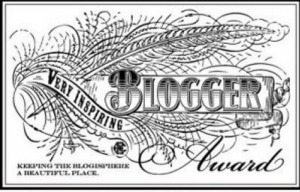 Here are the rules when selected for the Versatile Blogger Award. Nominate those 15 bloggers for the Versatile Blogger Award — you might include a link to the VBA site. Ok, I’ll start with the 7 things about me. This part does not appeal to me…dreading this, ha. I’d much rather be asked questions versus me talking about myself. Forgive me if they are lame. 2. I love spicy food…I’m talking habanero or hotter spicy. 4. I do not like scary movies. I hate the anticipation of being scared. 5. I went skydiving for my 30th birthday. 6. Sometimes I’m scared I’m fighting a fight I can’t win. Thank you belowrance for nominating me for the Liebster Award! When I first saw her message/nomination I didn’t really know what it is was, but I saw the word AWARD and that was enough, ha. The bloggers awarded must have less than 300 followers. Participation is completely voluntary and is not limited to any genre or writing for that matter. Basically, the blog can be about anything and simply has to be one that you feel is worthy and that you would like to give recognition to by passing it on. So I’m going to answer the questions belowrance asked me and then I’ll nominate my 11 bloggers and leave them 11 questions. Good thing they weren’t math questions, ha. 1. How did you feel when you got your first follower? Or realized other people were reading your words? Answer: It felt great. It’s nice to know that your likes and thoughts are worth following. 2. I am a car concert superstar (aka I belt out songs in the car with no one around), what is your song of choice when you are a car concert superstar? Answer: I do not discriminate. Each song I hear has an equal opportunity to be blessed by what I alone think is a beautiful voice. Answer: There’s many places I’d like to go. So to list a few would be Italy, England, Ireland, Brazil, Japan, Australia, and Greece. In the U.S. I’d like to go to New York, San Francisco, Las Vegas, and somewhere in the mid-west dominated my mother nature. 4. If you had to rush out of your house and only take one item with you, what would it be? Answer: I guess it would have to be my wheelchair now, ha. 5. What is your favorite baseball team? Answer: Oh for sure. I take pride in not taking myself seriously and if I want to shake what my momma gave me, I do just that. Answer: Probably right in between spring and summer. Not too cold and not too hot….so Sprummer. 8. What is the best concert you’ve ever been to? Answer: Hmm, well it probably wasn’t the best ever, but I emotionally needed it and live music can heal the soul. It was Jimmy Eat World at the House of Blues. Small, intimate, just right. 9. If you could be granted one wish, what would it be? Answer: Universal Peace. This would grant us freedom from our worries, which in turn effects so many other areas of our lives. 10. If you could switch professions tomorrow, what would you do? Answer: I think something with kids. They are usually brutally and/or beautifully honest and just seem to want to have fun first. Answer: Ha, how dare you Brooke. I still say Coke despite your warning. 1. When you are driving do you prefer windows or A/C? 2. What brought you to WordPress? 3. Do you bless people after they sneeze? 5. What is a favorite movie of yours? 6. Where would you live if you could pick any place? 7. Do you believe in God and/or practice a certain religion? 8. What kind of grades did you make in school? 9. What is one of your favorite songs? 10. When I’m riding or driving in a car I lean more towards music than conversation. Are you more for music or conversation? 11. Do you believe in true love?